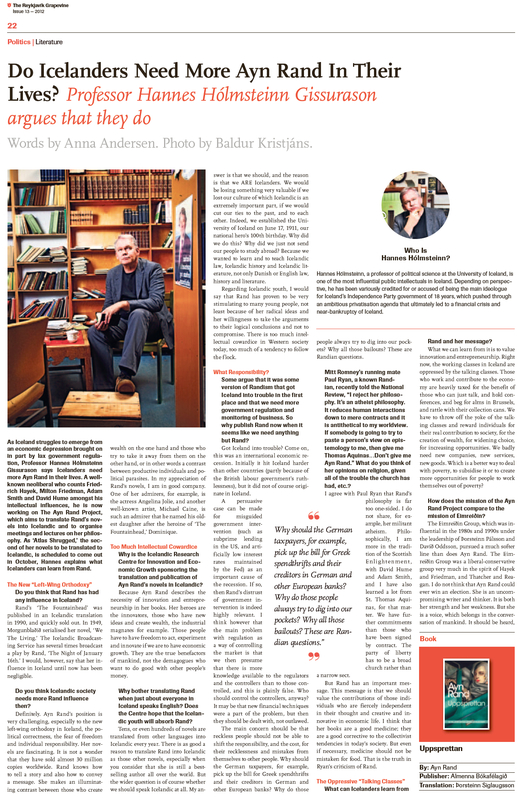 RNH is supporting the Icelandic Ayn Rand Project of the publishing house Almenna bokafelagid, AB. 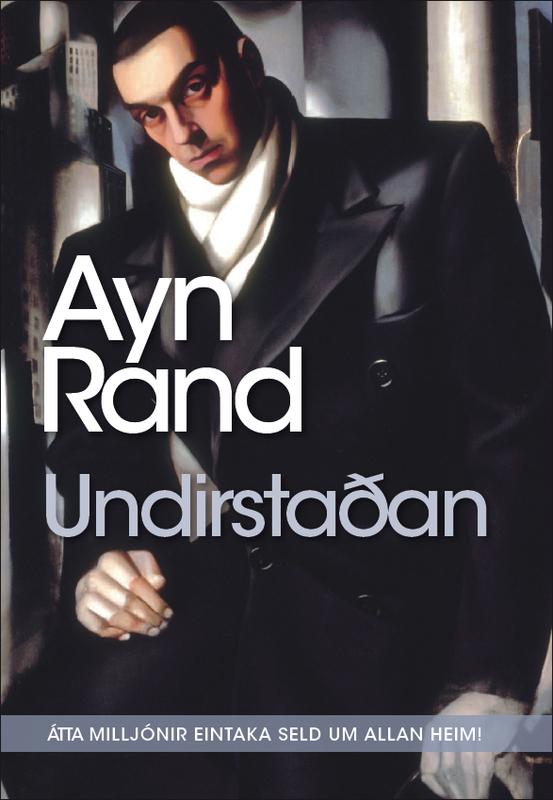 In November 2011, Rand’s Fountainhead (1943) was published in Icelandic in philosopher Thorsteinn Siglaugsson’s revised translation: It had originally appeared in Icelandic in 1990, but quickly sold out. The Icelandic title is Uppsprettan. In a 1949 film adaptation of the novel, Gary Cooper played the main hero, architect Howard Roark, who struggles to maintain his independence and integrity against both the moguls and the masses. Roark’s celebrated speech before the court can be viewed here. Dr. Tom Palmer of Cato Institute in Washington DC gave a talk 28 November 2011 on “Rand and 21st Century Individualism”. The same night, Dr. Palmer was keynote speaker at a very successful “Freedom Dinner” at Hotel Holt where young entrepreneurs and intellectuals celebrated, under the guidance of asset manager Gisli Hauksson, the Chairman of the RNH Board of Directors. In October 2012, Almenna bokafelagid published Rand’s best-selling novel Atlas Shrugged (1957), translated by Elin Gudmundsdottir. The Icelandic title is Undirstadan. The question posed in the book is: What happens if all the creative people in a society go on strike? What is the difference between productive persons and political parasites? Who is John Galt? Rand’s novel is also a steaming love story, with Dagny Taggart, an independent and courageous railroad manageress, dealing with Francisco d’Anconia, her childhood sweetheart and an Argentine copper mines heir, Hank Rearden, a married self-made steel magnate, and the mysterious John Galt, with a lot of other colourful characters participating in the slowly unfolding drama, such as pirate Ragnar Danneskjold, a conscious counterpart to the mythical Robin Hood. American philosophy professor Douglas Rasmussen gave a lecture on Ayn Rand and the moral case for individualism 26 October 2012. On that occasion, lawyer and philosopher Asgeir Johannesson, chairman of the Icelandic Ayn Rand society, also made a few remarks. As Rand’s account of individuality, entrepreneurship and creativity is highly relevant to the choices the Icelanders face in the near future between different economic systems, Rasmussen’s lecture formed a part of the series of lectures on “Europe, Iceland and the Future of Capitalism” which RNH is organising jointly with AECR, the Alliance of European Conservatives and Reformists. The same evening, Rasmussen was the main speaker of an elegant and well-attended RNH “Freedom Dinner” at Hotel Holt, directed by Gisli Hauksson. On 4 November 2013, Almenna bokafelagid published We the Living (1936) in a translation, originally serialized in the daily Morgunbladid in 1949. The translator is not known, but the work was thoroughly revised for the publication. The Icelandic title is Kira Argunova, after the main hero of Rand’s semi-autobiographical novel taking place in the early days of communist rule in Russia. Kira is a courageous and independent young woman finding the new regime stifling. Torn between two lovers, she decides to try to escape. Radio host Frosti Logason edited the book, with philosopher Asgeir Johannesson writing a postscript about Rand, her life and works. 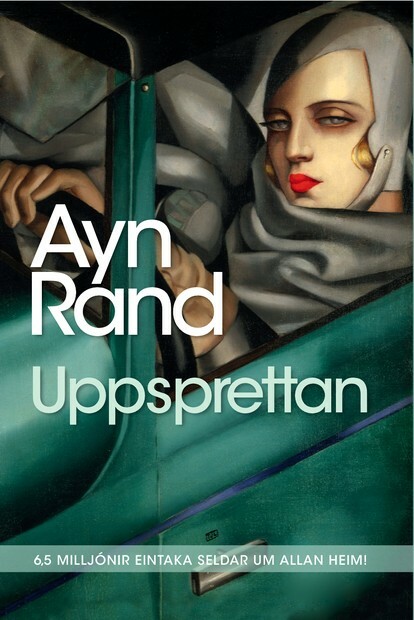 Dr. Yaron Brook, director of the Ayn Rand Institute in California, introduced the book in an eloquant speech at a RNH meeting at the University of Iceland. The publication of the book and the meeting with Dr. Brook formed a part of the project “Europe of the Victims” organised jointly by RNH and AECR, the Alliance of European Conservatives and Reformists. On 24 November 2014, Dr. Tara Smith of the Ayn Rand Institute gave a lecture about Ayn Rand’s moral case for capitalism at the University of Iceland, especially the use of money as encapsulated choice. On 5 November 2015, Professor Hannes H. Gissurarson gave a lecture on Ayn Rand, concentrating on the contrast between producers and parasites in her works. 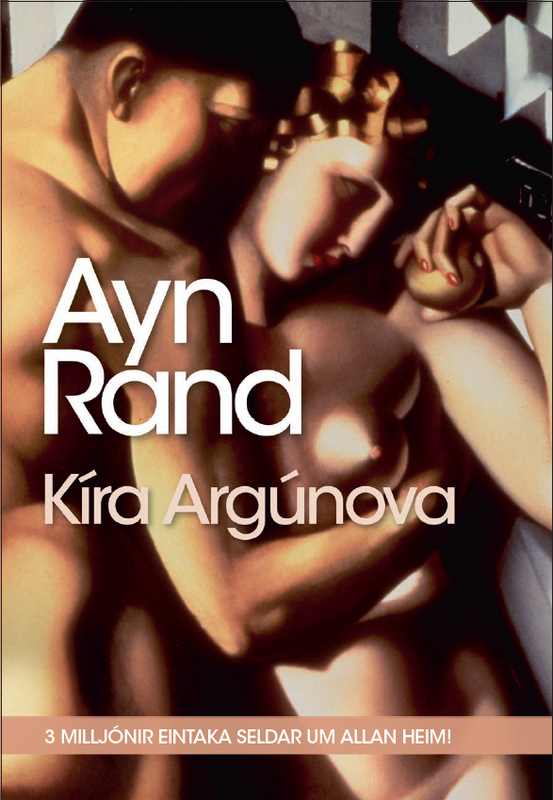 Possibly, at a later date, two other works by Ayn Rand which already have been translated will be brought out: Rand’s play, Night of January 16th, has been broadcast several times by the Icelandic Broadcasting Corporation, in a translation by the distinguished Icelandic translator and poet Magnus Asgeirsson; Rand’s short dystopian novel, Anthem, has been translated by Elin Gudmundsdottir. It is also hoped that at a later date, short films or Youtube videos in Icelandic, directed at young people, might be produced on Ayn Rand’s message and her relevance to Icelanders. Russian-born Ayn Rand, at one time a scriptwriter for big Hollywood studios, is one of the most distinct and independent American writers of the 20th Century. Some television interviews with her are accessible on the Internet, for example this one by Mike Wallace in 1959, this one by Johnny Carson in 1967 and this one by Phil Donahue in 1979. She is by far the most influential female philosopher of all times.